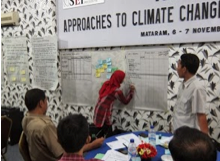 A customised two-day training programme was designed, following a training needs assessment of participants, to provide an introduction to key concepts and methods to inform an adaptation planning process. The training has been developed and delivered to be part of a project to build adaptive capacity in Lombok, an Indonesian island. The training began with an introduction to stakeholder engagement, including exercises designed to highlight the different viewpoints of stakeholder groups and the level of influence of different groups. This was followed by a session on vulnerability assessment, using the livelihood-exposure matrix as a way of identifying key climate vulnerabilities. Lessons have been learnt through this process about the training material, how it fits with the expertise of the group and about the logistics of training in an island setting in Indonesia. To this end the training modules have been translated into Bahasa.